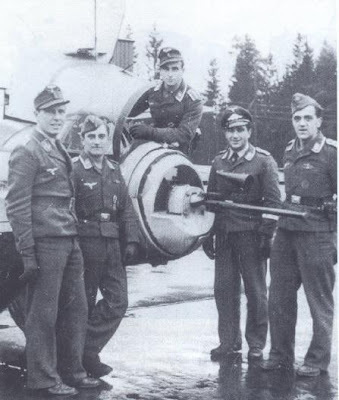 Above; KG 40 Heinkel He 177 crew of pilot Hptm. Stolle (centre) after their 'successful' combat with a 422 NFS P-61 Black Widow during the night of 14/15 August 1944. The Alsatians 'Max' and 'Moritz' also flew sorties. The American P-61 Black Widow nightfighter enjoyed an inauspicious start to its combat operations in the ETO. Some believed the P-61 was too slow to effectively engage in combat with German fighters and medium bombers, a view which the RAF apparently shared, based on the performance of a single P-61 they had received in early May. 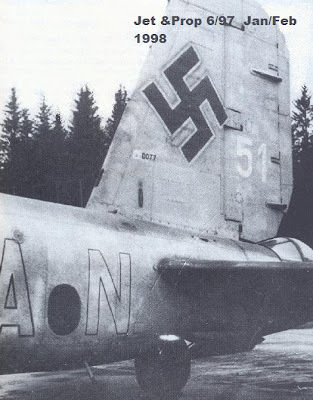 And in one of the Black Widow’s first engagements over northern Europe during August 1944 a 422 NFS P-61 sustained heavy damage attempting to down a Heinkel He 177 bomber. This incident was the subject of an article in Jet & Prop magazine (issue 6/97) entitled " Schwarze Witwe contra Greif " (‘Black Widow versus Griffon’) written and compiled by Michael Balss. The 422nd Night Fighter Squadron was the first P-61-equipped squadron to ship to England and began flying operational missions over England in mid-July 1944. The first P-61 engagement in the European Theatre occurred on July 15 when a P-61 piloted by Lt. Herman Ernst was directed to intercept a V-1 Doodlebug . Diving from above and behind to match the V-1's 350 mph (560 km/h) speed, the P-61's plastic rear cone imploded under the pressure and the attack was aborted. The tail cones would fail on several early P-61 A models before this problem was corrected. On 16 July, Lt. Ernst was again directed to attack a V-1 and, this time, was successful, giving the 422nd NFS and the European Theatre its first P-61 kill. 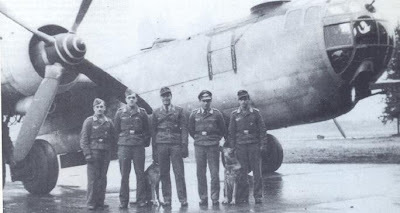 In early August 1944, the 422nd NFS transferred to Maupertus (near Cherbourg, Normandy) and began to encounter German aircraft for the first time. "..it was shortly before half past midnight. I had just carried out my instrument checks and was about to make my report to Hptm. Stolle when our tail gunner Uffz. Fabinger shouted over the EiV (Eigenverständigung - crew intercom), “ Achtung! Lightning at 6 o’clock. Maintain heading, I’m opening fire. ” At the same time we felt the fuselage shudder as Fabinger’s 2 cm cannon opened up. Fabinger was soon reporting “ .I’ve hit him, he’s alight, his starboard engine is on fire, he’s going down. Abschuß!.." The two other He 177s witnessed the downing (Abschußbestätigung) and confirmed it north of Bafleur (sic), France..(Barfleur, Normandy). The rest of the flight was quiet. Over the target there was some flak, but nothing in our direction and it was around 04:00 when we landed back in Schwäbisch Hall and were able to congratulate our gunner on his success.."
"..On my eleventh mission, 14 August 1944, we were doing a night patrol over the English Channel, and we got a bogie. So they put us on a heading to intercept, and pretty soon my RO says, "I got him". And we called GCI, and said, "We have him." We closed in, and my RO would tell me, gentle port, gentle starboard, increase your speed, decrease your speed. And he brought me in..Unfortunately he saw me before I saw him, and his tail gunner cut loose knocking out my starboard engine which immediately caught fire.."
“ Some of the enemy fire entered the top of my canopy, and lodged in and exploded the hydraulic reservoir just above and behind my head. That knocked out part of the hydraulic system. Fortunately the P-61 controls didn't operate hydraulically; they were operated by cables. So the hydraulic failure didn't affect the ‘flyability’ of the plane. My first reaction was complete shock—they didn’t tell us about this! Then all the training kicked in and I proceeded to function. I was scared, of course. I'd have to be a liar to say I wasn't. But I was so damn busy, trying to fly the aircraft at that point that I really didn't have much time to think about it. But I knew that I was in trouble, and I was trying to work my way out of it. I could communicate with my RO over the radio, but in hindsight I should have talked more, because he didn't know what the hell I was doing, and he was scared to death...So here I am, a flamer, 50 miles out over the English Channel. I feathered the starboard engine right away-- I did the right thing there. And I dove it a little bit to gain speed, and put the fire out. My radio was still somewhat operational, so GCI vectored me back. My guess is that it might have been fifteen minutes before we reached the airfield, but it seemed like a long, long time. I came in on one engine, and I lowered my landing gear, not realizing that my nose wheel had been shot out from under me. Considering everything, it was a good landing, except that when it came time for the nose wheel to drop, there was no nose wheel. So I skidded on the front of the plane to a stop..."
Impatient Widow" # 91, tail number 42-5591 had its starboard engine shot out along with oil lines and hydraulics. Arriving back at their base in Maupertus the nose-wheel failed to come down but the crew escaped the ensuing crash-landing unscathed, with damage assessed as CAT B/E. The Widow’s fuselage, engines and other salvageable equipment were used for spares of which the ETO Black Widow squadrons had little during their time in northern Europe.